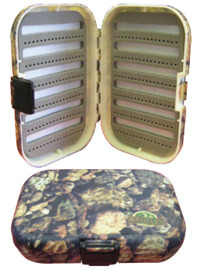 Snowbee's range of lightweight pocket fly boxes offer convenient fly storage at a great price. Moulded in lightweight, grey ABS plastic, for strength and long-life, they come in 3 different models to suit all requirements. 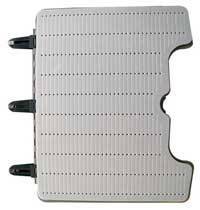 The interiors are fitted with high density foam, with fly-holder slits for a secure grip and easy fly removal. This method extends the life of the foam by not having to constantly pierce it with the hooks and provides the tidiest fly box ever! 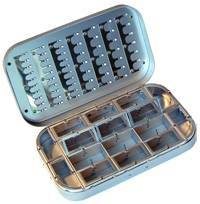 Available in 3 different sizes to suit a wide ranging choice of fly patterns and fishing applications. The same features as the medium box, but in a slimline profile. Ideal for a shirt pocket when travelling light and perfect for small river dries and nymphs. Holds up to 150 flies. 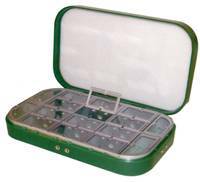 These simple, double-sided moulded fly boxes are fitted with a simple side clip and spring hinges, so they can be opened with one-hand and spring open automatically. Size: 41/2 "x 31/2"x 1"
The deeper of the two models, ideal for travelling light, with a mix of dry flies and nymphs. Holds up to 150 flies. The largest in the range, the clamshell design has a simple clip closure plus a folding centre leaf to double the holding capacity to an impressive 372 flies. This centre leaf has a rigid core, so it will not flex like some models, causing the flies to dislodge. A rubber gasket around the rim makes this fly box 100% waterproof. 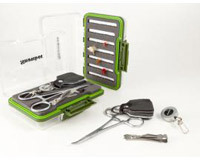 An innovative new, combined Fly Box and Tool Kit containing everything needed for a days fly fishing - zinger, stainless steel snips, long nosed, lockable forceps and leather leader straightener/fly line cleaner. 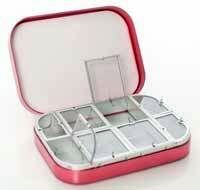 Comes with a spare fly foam so once the tools have been removed, it can be fitted to make a double-sided fly box. 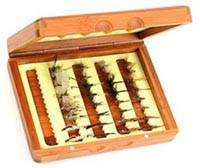 The ideal gift for the fly fisherman who has everything! Colour: Green with clear lids. 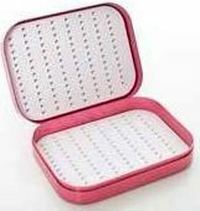 Size: 6" x 4.1" x 1.8"
These innovative fly box designs offer a completely new concept in fly storage. 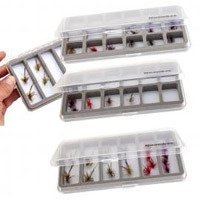 Snowbee's ultra-slim profile fly boxes, take up the minimum of space and slip easily into any shirt or vest pocket, making them ideal for the roving bank or river angler. Manufactured from a tough, flexible, crack-proof ABS for durability, which is also see-through on the lids for quick, easy fly selection. Designed with the serious fly tier or fly fisher in mind, this innovative kit consists of five of our Slimline Fly Boxes, neatly stored in a zip-closed divider bag, taking up the minimum of space. Between them, the five Slimline Fly Boxes will hold up to an amazing 1,170 flies in a carry bag of just 20cm x 12cm x 8cm (8 x 4.75 x 3.15)  enough for the keenest fly fisherman or fly tier!  Constructed from super strong ABS plastic with see through lid.  Manufactured with the highest quality pre slotted foam.  Super slim design is ideal for smaller flies. 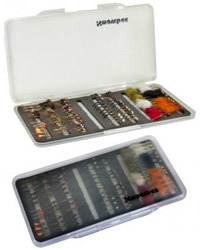  Clear plastic construction allows for quick and easy fly selection.  Large (1758) perfect for buzzers, nymphs and small dries.  Extra Large (1759) has extra depth for bulky flies. Fishing is also a question of choice. The choice of the design meeting the needs of the fisherman. The enthusiasm for overcoming the challenge of improving the handling of flies before, during and after a fishing day. Only by maximizing the perfection of choice it is possible to achieve something as spectacular as a Flypad. 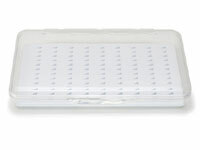 A minimum thickness ergonomic design that offers the convenience of seeing the flies without having to open the box. It was requested from this design to protect the flies from water without disturbing them. It was possible to reach even further, demanding from it to immediately adapt to our plans and fishing scenarios. 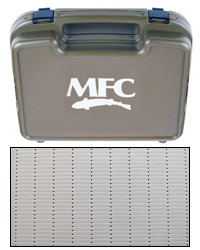 We got the answer: FlyPad, the waterproof fly box with modular interior features and easy to store. Aluminium fly box to celebrate 100 years of the first ever printed fly box. The original 1913 Loch Leven Eyed Fly Box was printed on tin plate and made by Richard Wheatley. This version uses the original design and is in aluminium for todays fisherman. Limited Edition and no doubt will become as collectable as the original. To comemorate the history of this iconic fly box, one in every hundred of the new Loch Leven Fly Box will contain a free original Loch Leven Eyed Fly Box. 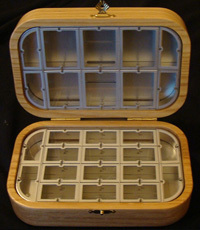 Hand-crafted fly boxes machined from either Cherry, Ash or American Black Walnut.